A mighty barbarian leads a horde of savages against his blood-sworn foes. A reluctant rebel pilots his star-fighter against a galactic empire. A party of adventurers raids the tomb of an ancient lich. The Savage Worlds game engine handles all those tales and more - from dungeon crawls to high-speed chases to mass battles - quickly and easily. This latest printing of the award-winning, best-selling Savage Worlds rules combines numerous new powers, Setting Rules, situation rules, and updates into one convenient, full-colour book. 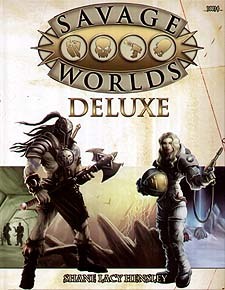 Featuring all new art and Design Notes from the creators, Savage Worlds Deluxe is Fast! Furious! Fun!